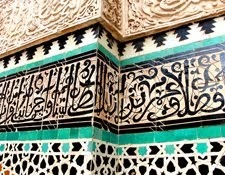 For first time visitors to Fez, here is a quick "where to eat" guide. If you are visiting the Fès Festival, then you will also find some suggestions for places to eat before the evening concerts. *STREET FOOD is good - take your pick of any of the sandwich places around Bab Boujloud and the market at the top of Tala'a Kebira. Choose your filling from the display and watch as it's cooked on the grill. For around Dh20, you'll get half a round loaf, or a small baguette, stuffed with grilled chicken, tomatoes, onions and olives, or beef and liver, or merguez sausage. Chips or fried eggs are an optional extra. Many of the stalls also do vegetarian options with fried aubergine slices or green peppers. *SELF-CATERERS are in for a treat with markets at the Bab Boujloud end of Tala'a Kebira and in R'cif. All sorts of meat (except pork, of course), fish and a wide array of fruit and vegetables are on display. Cheese is limited to a softish white variety wrapped in leaves - very tasty, too. 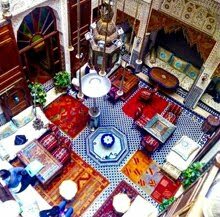 *BAB BOUJLOUD: there's a wide selection of restaurants near the famous Blue Gate, from the well-known Thami's to Abdou's Restaurant Fassia, Restaurant Bouyyad, Rachid's and the Kasbah and several others. Choose one where the seatcovers appeal to your sense of style (gold with large bows, polka dots or zebra stripes?) 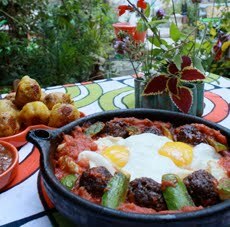 and enjoy a fairly standard range of Moroccan traditional dishes. A three-course meal with water or mint tea will set you back around Dh100. 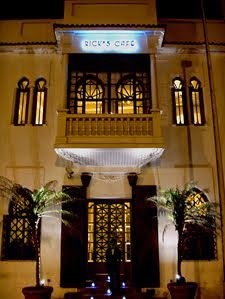 *CAFE CLOCK is in Derb Magana, just off Tala'a Kebira at the Water Clock and Bouanania Medersa. Excellent breakfasts, good coffees and teas, cafe food and the famous camel burger are on offer. The Clock also features art exhibitions and Sunday sunset concerts. *F LOUNGE is well sign-posted about half-way down Tala'a Kebira and Tala'a Sghira on Zqaq Rouah, and offers tartines (open sandwiches) with camembert and walnuts, or anchovies and tomatoes and hamburgers. 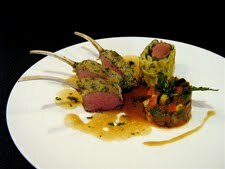 There's also a wide range of Moroccan dishes produced in the newly-enlarged kitchen. 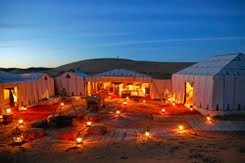 Relax with a shisha on the divans at the back! *CHAMEAU BLEU is tucked away in Derb Tariana near the Bouanania Medersa and deserves much more recognition that it seems to get. Comfortable seating inside and a lovely terrace for evenings, the menu has good High Atlas trout and succulent lamb chops cooked on the charcoal grill, as well as pasta. *RESTAURANT BERRADA is a little off the beaten track in Achebine, but well worth the effort. Traditional Moroccan fare is available and in such a wide array that you'll be taken into the kitchen to taste a little of each pot before you choose. 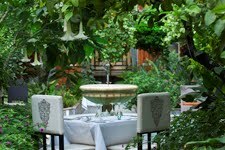 *FES ET GESTES has a lovely garden - the perfect place to escape the heat with a mint tea (see our review here). 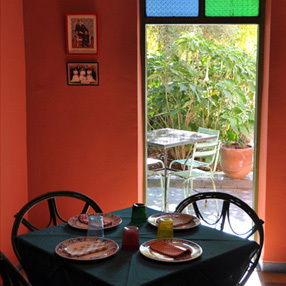 The lunch menu offers traditional Moroccan cuisine. 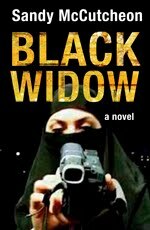 Find it at 39 Arsat El Hamoumi in Ziat, phone 0535 63 85 32. *NAJMAT SOUAFINE in Oued Souafine (see our review here). It has a roof terrace as well as a cool interior. Lunch is Dh120 and dinner Dh150. The emphasis is on light, fresh food. *AJI CHOUF in Ziat (see our review here) features pizzas. For lunch you could also try the salads or terrine and well as a delicious dessert. 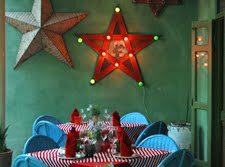 Fez Cafe at Le Jardin des Biehn: This is a fun bistro set in a beautiful garden, and well worth seeking out. Lunch is served between noon and 15h00, and for the festival, dinner will be available from 18h00 to 23h30. 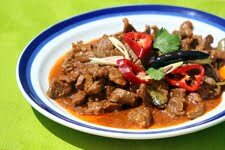 Do make a reservation for dinner on 06 66 26 08 24. 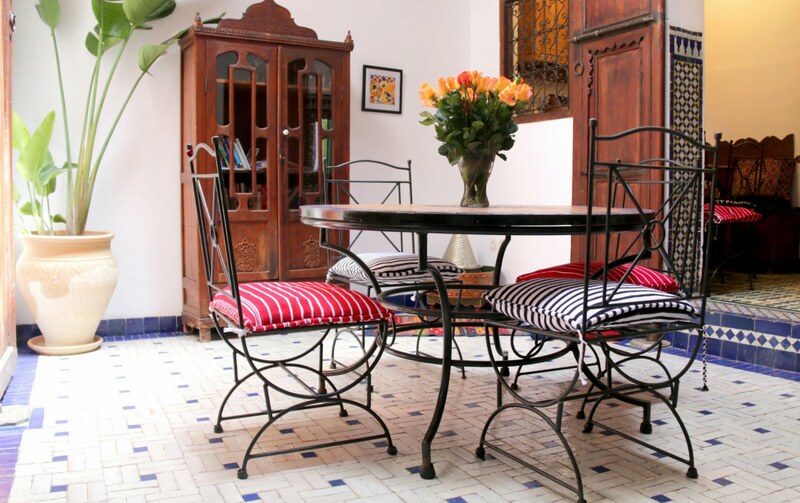 Dar Roumana is a guesthouse on the north side of the medina, close to parking at Bab Guissa. it has wonderful medina views from the terrace and a great chef. 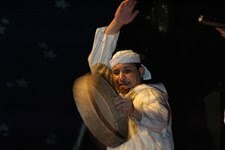 Dar Roumana is offering Fes Sacred Music Festival Special Pre-concert dinners with Vincent @ Dar Roumana. At Ryad Salama between the two main streets of the medina, you can choose between a Moroccan menu (Dh250) or a delicious fusion of Moroccan and French delicacies (Dh330). 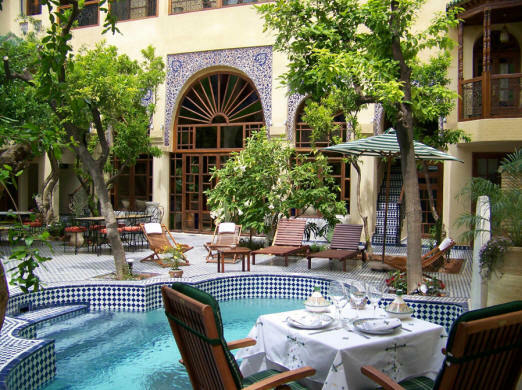 Dining is under the stars in the leafy courtyard of this beautiful riad. There's a dining room too, in case of inclement weather. Booking essential 24 hours in advance on 0535 63 57 30 or 0661 10 25 21. Palais Amani is a gracious guesthouse in Blida, near the tanneries. It's offering their usual set three-course menu at Dh320 per person, or a pre-concert buffet menu at Dh285 for a mise en bouche, a main course and dessert. 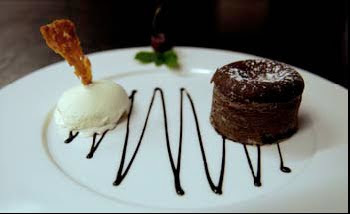 If you're staying at the Palais or in the area, you can have the main course, go to the concert and come back for dessert afterwards in order to finish your meal on the roof terrace under the stars. Post-concert dinners are available up to 23h00. Book on 0535 63 32 09. 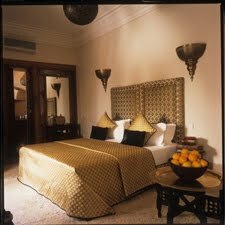 *RIAD LES OUDAYAS: this beautiful riad in Douh has innovative twists on Moroccan standards served in the leafy courtyard. Wine available. Dinner only by reservation: +212 (0) 535 636 303. 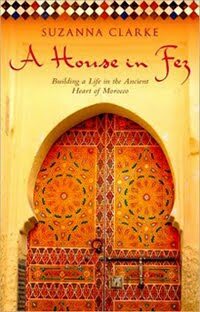 *RIAD FES has a superb restaurant featuring traditional Moroccan cuisine. Reservations: +212 (0) 535 947 610. Good winelist. *Over at Oued Zhoun you'll find the very stylish PALAIS AMANI. The rooftop terrace is a good place for lunch when Mediterranean cuisine is served. The dining room is open in the evenings for more traditional fare. Reservations essential on +212 535 633 209. Wine available. And what if you're longing for a beer or glass of cold gris on a hot summer evening? *Right next to the Batha Museum, venue of Festival afternoon concerts, is HOTEL BATHA which has a pleasant bar and courtyard in which to quench your thirst. *Handy for Bab al Makina and the free concerts at Boujloud Square is MEZZANINE, just outside the medina walls at the Jnane Sbile gardens. Mezzanine has leafy roof-top views, and serves good salads, pasta and tapas. *The bar at RIAD FES in Zerbtana near Batha, also close to the Museum is set around a reflecting pool and is very smart. *Top of the pops and very trendy for lunch or dinner is MAISON BLANCHE, at 12 Rue Ahmed Chaouki, opposite the Jnan Palace Hotel. 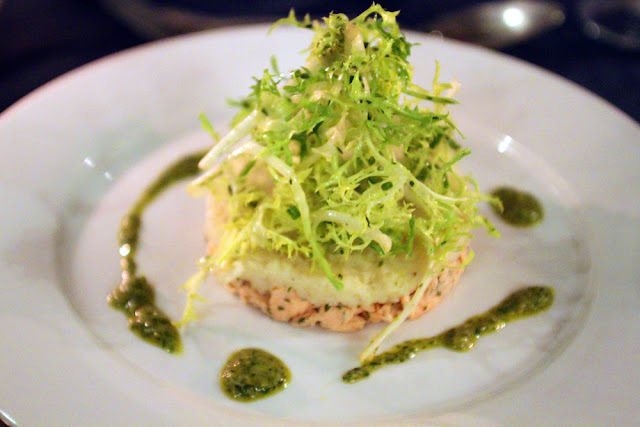 It has excellent cuisine, a good wine list and a bar upstairs. +212 (0) 535 622 727.